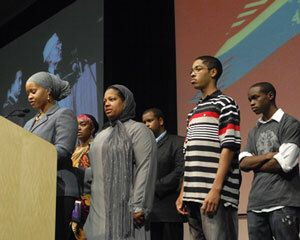 CHICAGO (FinalCall.com) - Sympathetic thoughts and prayers have poured in from all over the country after the death of Imam W. Deen Mohammed, one of the most influential Muslim leaders and scholars in the United States. 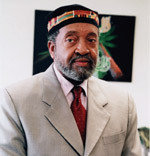 Imam Mohammed, a son of the Honorable Elijah Muhammad died at the age of 74 at his home in Markham, a southern suburb of Chicago on September 9. 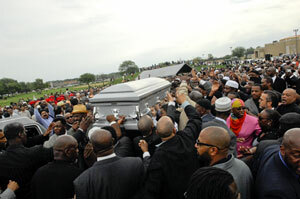 Thousands came to pay their last respects to Imam W. Deen Mohammed on Sept. 11, 2008. 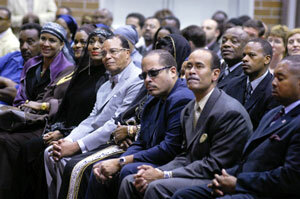 Minister Farrakhan, family members and Nation of Islam laborers at the memorial tribute held for Imam Mohammed on Sept.13. 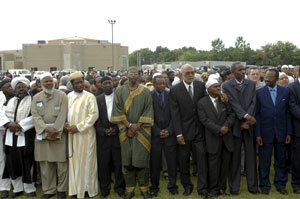 Muslims from many different Islamic communities and locations were present for Imam Mohammed�s Janazah prayer service and burial.